The one 120 litre fermenting barrel we had, was divided between two barrels of the same size since this made it easier to handle and loadeonto the cart as shown in this picture. We also took about 15 kg. of firewood with us as the distillery prefers distillers to bring their own firewood to so that they don't need to stock up in firewood. 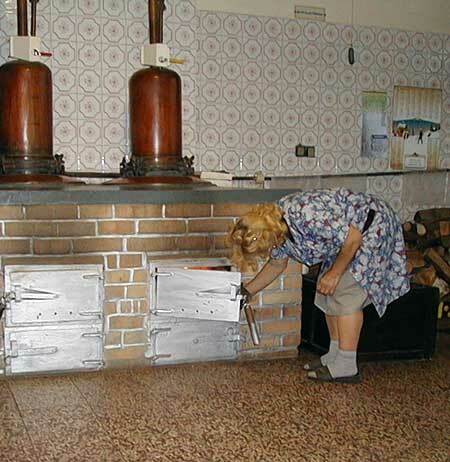 This distillery is a privately run distillery but under government supervision with a alcohol drop meter, which collects 1 drop of Slivovitz for each litre of distilled Slivovitz, and hence the state gets it's share from each Litre. This comes to about 30% of the cost of 1 littre of Slivovitz. 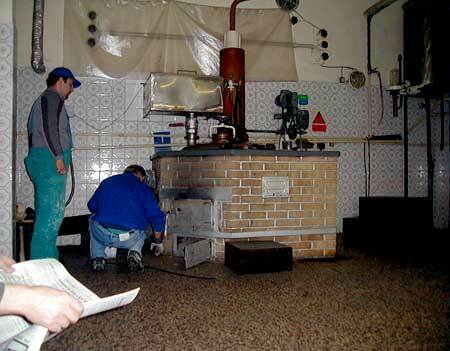 The fermented plum brew barrels were loaded with a electronic lift thing onto the ramp (to left of the image) and then brought into the room where the brew is poured into the first Slivovice distilling boiler. 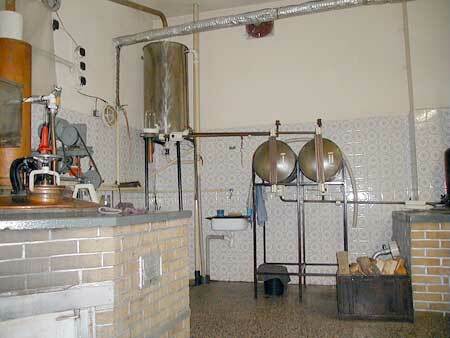 Here, Luda is pouring the fermented plum brew into the top of the distilling boiler, which is in another room on the other side of the wall. The 2, 120 Litre barrels, although only half filled was too heavy to lift so first a few bucket loads of brew were poured in using a bucket, and then the rest was just tipped in from the barrel. 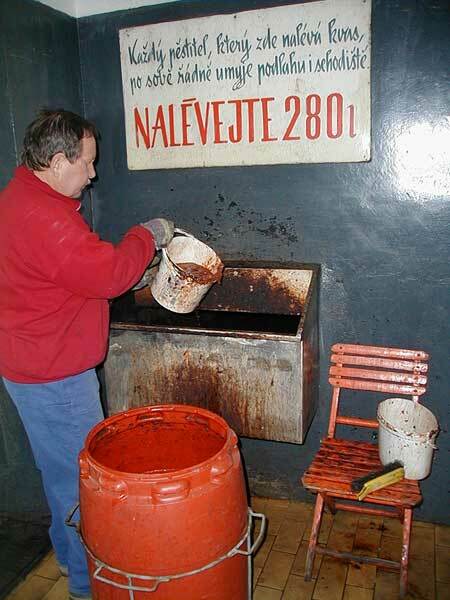 The sign states that everyone puring in their fermented brew should clean up the mess after themselves and also that the maximum load of ferment to be poured in at one single go is 280 Litres. This distillery functions as a conveyor belt factory line and before me and Luda, there were two other distillers in front of us. These two in the picture had just poured in their own brew (ours was still in the funnel box above with the tap turned off) and they are stoking the boiler with wood. 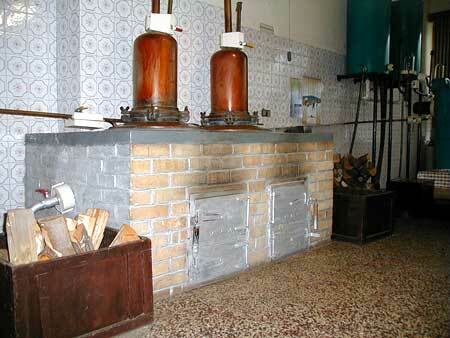 Inside the distillery - the main Slivovitz distilling boiler. Here we are on the other side of the wall and next to the reddish copper funnel thing, to it's left you can see an aluminium box funnel. That is where from the other side the fermented plums were poured into. And from there all the brew went into the distilling boiler which is inside the brick box you can see. Infact the top of the boiler is visible here - looks like a large saucepan lid just on top of the brick box. Click the link to see a diagram of how a distilling plant like this one works. 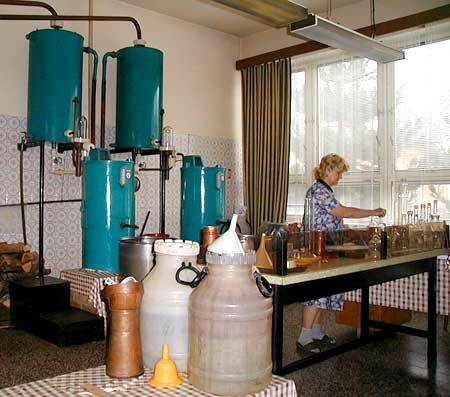 If you didn't click the link above where the whole process of distilling Slivovitz at this particular Slivovice distillery is explained you should as it will make understanding the following images easier. Here we have the first boiler, from which the distilled rsult ends up in one of the distilled containers - which look like two water tanks. What happens to the distilled plum remains ? 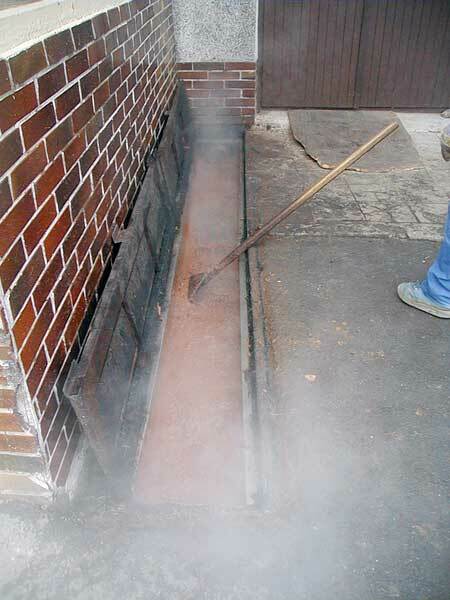 Once the first distilling is completed and the distilled plum result has ended up in one of the distilled containers, the actual remains from the first boiled are emptied into a trough just outside the distillery room. 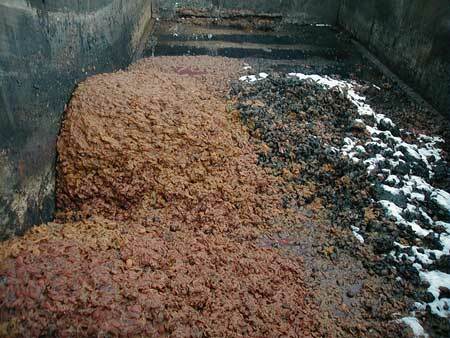 This is a brown goo and each distiller is then expected to shovel this stuff into buckets and pout it into e narby kip. And here it has all poured out and now has to be scraped together and shovelled away. More back-breaking effort in making Slivovitz. After a few minutes most of the remaining liquid sifts down throug the grate in the trough and we're left with a pile of distilled remains of plums and plum stones. 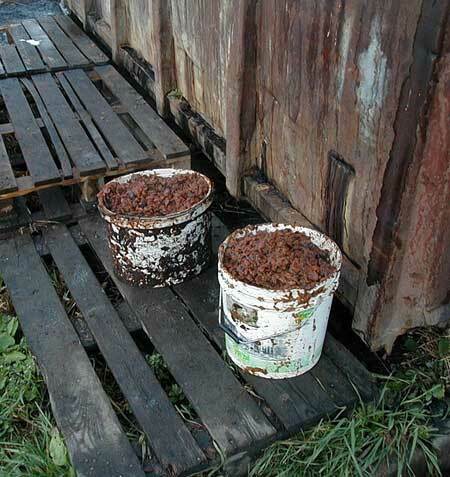 This is then carted about 20 feet using buckets like these and tipped into a nearby skip. 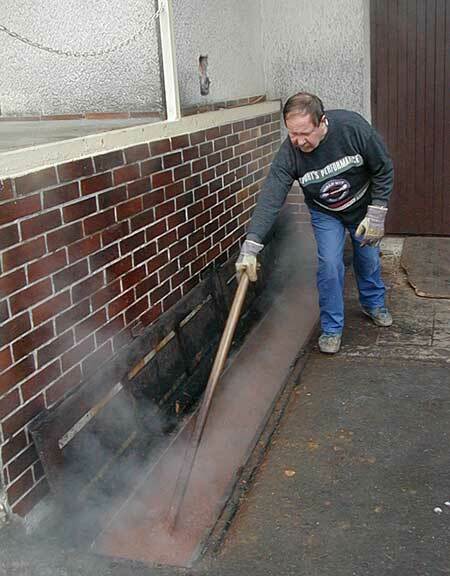 The stuff makes great manure for gardens or - even plum trees. Back in the Slivovitz distillery. After the first boiler, and then from the first distilled container (not visible here but is on the left) the distilled product is let into one of the second boilers for the second distilling. As in the case of the first boiler, the second two boilers are also stoked up with firewood from beneath them. From the second boilers (either from one or the other depending on which one was used for that batch) the final distilled Slivovits, is first condensed in one of the secondary condensers, and then ends up in one of the secondary distilled containers. In this image the top containers are the secondary condensers, underneath them are the secondary distilled containers, and each of these has a stainless steel barrel underneath it. Here you can just about see one of these just infront and below the left secondary distilled container. So now we have our distilled Slivovitz. 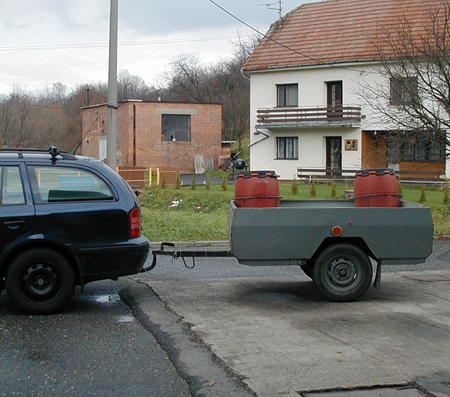 We may have our distilled plum brew, but we're still miles away from getting our final Slivovitz. Up till now, we've probably done what anyone can do even in their own kitchen using a few pots and pans. The tricky part now is to avoid getting the first litre or two of undesirable first distilled crap, to stop the distilling in time to avoid getting the last few litres of distilled crap, and to fine-tune all the rest of the distilled plum brew into top class Slivovitz. What do we need to do this ? and a few prayers directed at the original quality of the fermented plums and the know-how of our elderly lady. Go to the final section where the final fine.tuning and mixing of the distilled plums will turn it all into perfect Slivovitz. 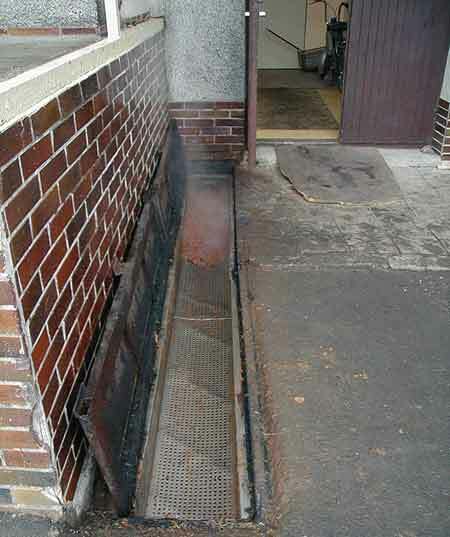 The steam produced was condensed in the primary condenser. And finally, the final condensed Slivovitz end up in one of the secondary distilled containers. From where it drips into the final stainless steel barrel ready for mixing with distilled water. Yep -and that's the only way unless you intend on drinking something which is nearer to pure alcohol than fine Slivovice.